It seemed to happen overnight. Charlie’s Ale House turned into Acre. Charlie’s had been a quiet Andersonville mainstay for a long time. People seemed to like it, despite its quasi-Applebee’s atmosphere and menu. But let’s not dwell on the past. Thankfully, the new owners left the antique bar and beautiful old light fixtures. As near as I can tell, they didn’t do much to the interior, other than take down some decorations and slap some gray paint on the walls. It has a similar feel, though it’s a bit more austere than good old Charlie’s. As it turns out, the new owners aren’t exactly new. The fine folks behind Anteprima are in charge now. What I didn’t know until I read this article was that they owned Charlie’s all along. Apparently, they’re just updating things and bringing over the chef from Anteprima to enliven the menu. Acre is split into two restaurants. The Tap Room and the Dining Room have two completely different menus, and separate kitchens. On one side: upscale pub grub and flat-screen TVs. On the other: American gourmet, fireplaces and artwork. You can’t order from the Dining Room menu if you’re eating in the Tap Room, and vice versa. The beer menu is awesome. Not Hopleaf awesome, but there’s thirty beers on taps and a plethora of bottles. Our meal started with the baked feta, which was really good. Creamy and a bit tart, with a texture of cottage cheese. Things went downhill fast when we got to the main dish. I ordered the turkey pastrami, and was kicking myself for not going with the burger. Having lived in New York City, I expect a pastrami sandwich to be loaded with artery-clogging goodness. What landed in front of me had as much girth as a PB&J. There were two slices of turkey pastrami between the bread. Seriously–two fricking slices. It tasted bland, and everything else on the sandwich overpowered the meat. My imaginary Jewish grandmother would be appalled. Much better experience. If this was one of those old westerns, where the sheriff draws a line in the sand and says “which side are you on?”, I’d go with the Dining Room. Even though there are no flat screen TVs showing sporting events. Here, I ordered the Amish chicken breast, and it was perfect. Tender and juicy, perfectly seasoned, and with one of the crispiest, tastiest skins I’ve ever had. I can’t say enough. And the service matched the food. Whereas in the Tap Room, I’d label the staff as a little “unconcerned,” in the Dining Room, our waiter was attentive and knowledgeable. I’ve never been to a place with a split personality, but I’d say Acre has one. Good and bad, fine dining and pub grub, delicious and disappointing. It’s hard to know what to make of this place. There’s definitely enough potential here to warrant many return trips. I hope they figure out a more consistent approach. I feel like the neighborhood has traded a bedrock institution for something with more promise, but also more frustration. Each time I go, I’ll be hoping for the former, but preparing myself for the latter. 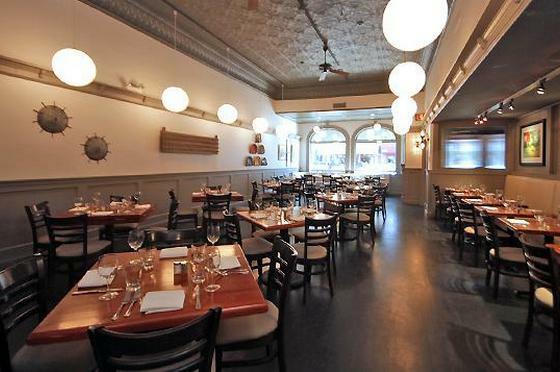 He’s right, Acre does seem a tad schizo with its two-restaurants-in-one approach. My hunch: they’re hedging their bets with Charlie’s devotees. The Tap Room menu is way more sophisticated than Charlie’s menu, but it hasn’t lost its hearty comfort-food appeal or its reasonable prices. I was a huge fan of that feta dish he mentioned, but it wasn’t on the menu the last time we visited. The selection changes daily, depending on what’s in season. A good thing, no doubt, but be careful with your heart and don’t get too attached. While I’m all about swapping fish sticks for oysters on the half-shell (which are actually on the menu), my sense is that the Tap Room is still finding its sea legs. In addition to shabby service, my vegetarian mac and cheese came sprinkled with bacon bits, but there were so few that I’m pretty sure they caught their mistake and tried to remove the the evidence. I’m on to you, Tap Room. Like a hawk. Oh also, when the waiter took my dish away, he dropped the cheesy spoon onto my dress. Accidents happen, but the dish should have been taken off the bill. The Dining Room has its act together, though. I had the turnip graten and the celery root risotto. Both were divine and both came topped with a hard-boiled quail egg, a fact for which I have no explanation. The decor is rustic and modern (don’t listen to my guy; it’s changed drastically), with tractor seats and wagon wheels on the walls. We’ve been to Acre three times since it opened up a month ago. I forgave the mac and cheese incident and am very excited about our new neighbor. Don’t get me wrong, Charlie’s was alright, I guess, but – sorry, Charlie – Acre is just so much cooler.